My sister-in-law introduced me to Goodreads about a year ago. I started an account, listed some books, and promptly forgot about the whole thing. Then, a few months ago, I discovered that there was a Goodreads app. I downloaded it and have checked in literally every day since then. I’ve organized my shelves and listed as many books as I can recall reading. While I don’t post reviews (I do write book recommendations here though! ), I star books and my Read list has become a journal of sorts. My To-Read list has grown by leaps and bounds and is now a book shopping list that I carry with me and consult every time I set foot in a Borders. I check out my friends’ updates daily and often add their new additions to my To-Read list. When I hit a bout of insomnia (which lately has happened more often than I care to admit) I often turn to Goodreads reviews. When I dislike a book, I quietly commiserate with the people who wrote unfavorable reviews, and when I really love a book, I have an inward celebration with those who left glowing reviews. I also sort of love reading (thoughtful) negative reviews of books I’ve enjoyed. I’ve found that I learn a lot from fresh, differing perspectives. Wow, nice reading space. I’m thankful for books, the online writing community, and the gift of two new houseplants on my desk. I don’t do houseplants (black thumb, as my husband says :)) but I do love fresh cut flowers. 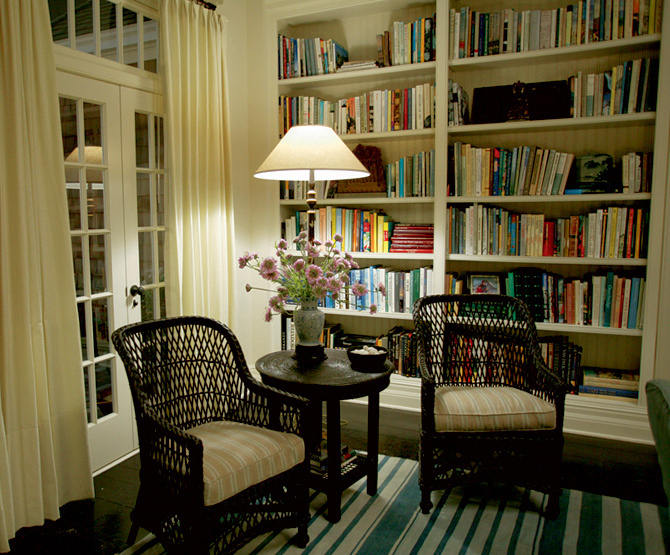 And I love that reading space too… I only wish it was mine! I’m thankful for friends, my hubby, and medicine. I’m recovering from a minor surgery that has turned out to be a bit more painful that I’d thought. So, right now, I’m very thankful for prescribed drugs. LOL. My hubby and friends because they’re taking great care of me!! I don’t update my Goodreads account much anymore [I think I would if I had a *real* smartphone and could use an app 😉 ] but I love the site. The first thing I do when I finish a book I really loved or disliked is head to Goodreads to see what other people thought or felt. I love that it has created such a strong community of readers and book-lovers! I feel the same way, Rebecca. It’s so much fun to see what others thought of a book, especially one I loved.